Update, June, 2017: I’ve downloaded the latest data for my AncestryDNA matches, and with 230+ more cousins, I can report the exciting news that: the chart continues to look like a kitty cat. But, I did have 2 more close cousins show up – one of which I knew already, so our common matches might help triangulate. Waiting to hear from the latest close match… if you’re out there, let’s figure out our trees! I’ve appended the new tree, with an additional, totally free bonus chart of total cousins by distance. If you are like me you probably say “Harumph!” alot when you check for new genetic matches to your AncestryDNA test. Scrolling through 83 pages of matches, it gets a little depressing seeing the many, many, many “No family tree” next to the matches. And the many more with only token trees containing a small number of people in them. Anyway, I know that sometimes things feel worse than they are, so I decided to crunch some numbers and see how bad (or good) I really have it. 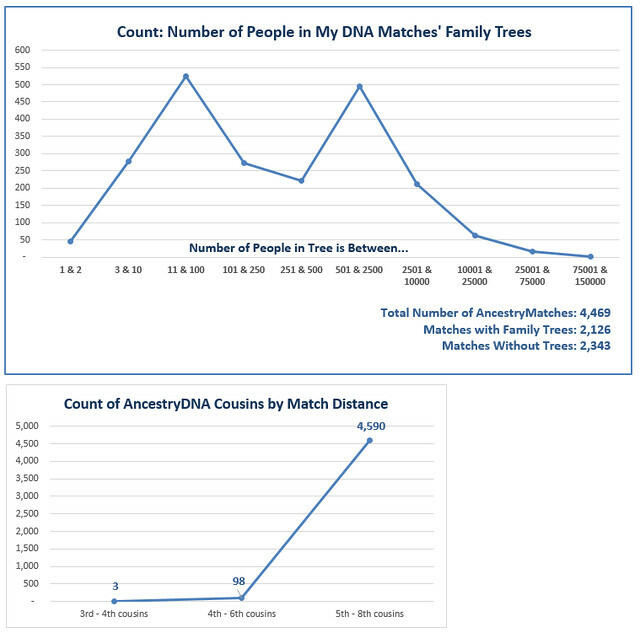 Using the handy dandy AncestryDNA Helper Chrome Extension, I scanned and downloaded a data file of my matches. I found that I have 4,230 matches in the database. 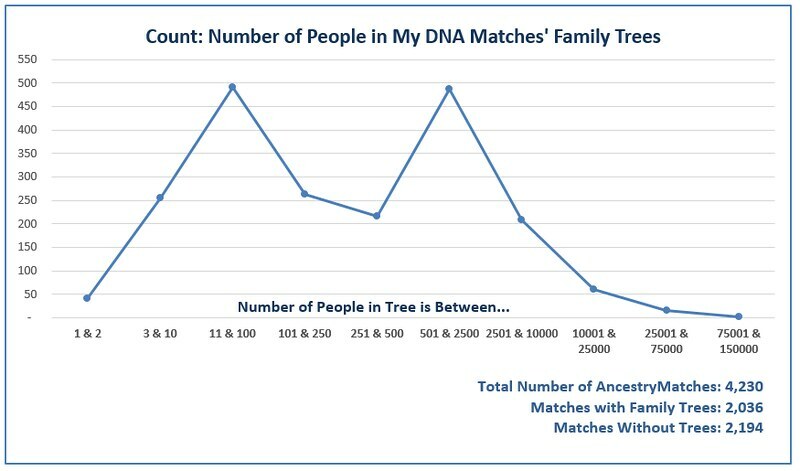 Of those matches, 2,194 do not have a family tree attached to the DNA profile. BOO. But, that leaves 2,036 matches that do have family trees. YAY! What are the size of these trees? Well I charted it out. Chart of Number of People in my AncestryDNA matches’ family trees that also kinda looks like a kitty cat. However, flipping that around in my brain, about 1,400 people have trees with 50 or more people – that might get us somewhere. *For more information on AncestryDNA circles, you might want to watch their video Cousin Matches and DNA Circles over on The YouTube. **AncestryDNA representatives: you can use “It’s better than a stick in the eye!” in your next ad campaign, but I’d appreciate a few gratis test kits for my trouble. UPDATED Chart from June, 2017: Same old same old. Chart of Number of People in my AncestryDNA matches’ family trees that also still kinda looks like a kitty cat, but with higher ears.